The one comprehensive tool for field inspection,analysis and cleaning. 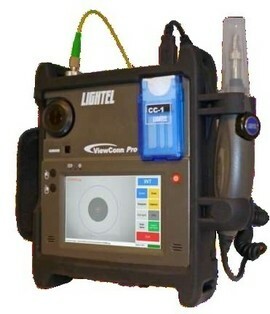 ViewConn® Pro (VC-8200) is an integrated system for fiberoptic connector inspection, evaluation, documentation and cleaning. An integrated power meter is also available as a customer installable add-in. With built in Wi-Fi , ViewConn Pro can send its Pass/Fail analysis reports via email to other locations or store them directly within the unit. The Lightel originated dual microscope concept allows rapid inspection of both male and female connectors without changing tips. The auto-centering feature allows faster connector endface location and analysis with the probe. Designed for ease of use in the field, the 5" display provides clear, sharp images, and the large touchscreen buttons provide all the necessary controls for image capture and analysis. As is its trademark, Lightel's pre-installed ConnectorViewTM Plus software requires no calibration and provides its analysis reports in seconds. With ViewConn's traditional ruggedized cover and integrated cleaning cassette, ViewConn Pro is the only comprehensive tool for field inspection, analysis and cleaning.